Foto: Fender Page visited Fender in California to sign headstocks. 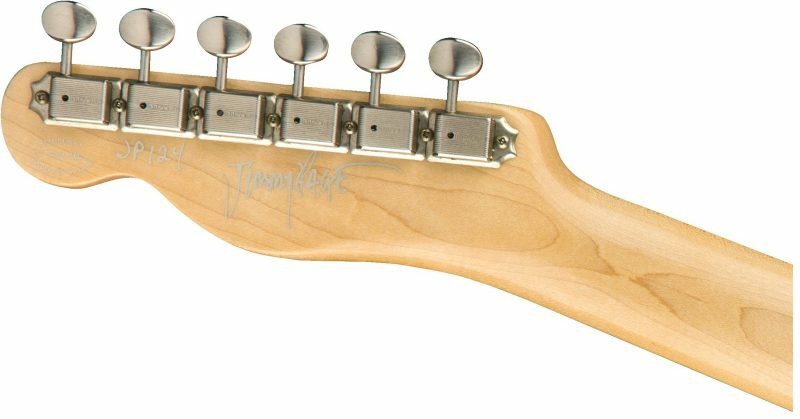 Legendary Led Zeppelin founder and guitarist Jimmy Page approached Fender to recreate his “dragon” Telecaster from the band’s early years. To celebrate the anniversary, 50 dragon Teles will be manufactured, as well as 50 recreations of an earlier Page modification to his ’59, with mirrors applied. All will bear Page’s signature and come with special cases and accessories. 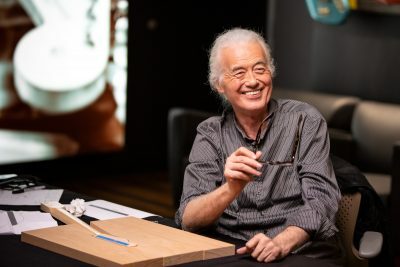 Jimmy Page hasn’t played guitar much in public since Led Zeppelin‘s reunion concert in 2007, at London’s O2 Arena where the band celebrated the legacy of Atlantic Records co-founder Ahmet Ertegun. There was a rendition of “Whole Lotta Love” at the 2008 Olympics closing ceremony and a lovely stint on the acoustic at Roy Harper’s 70th birthday concert in 2011. But otherwise, the 75-year-old musician has been content to refine Led Zeppelin’s considerable legacy in other ways. Fender master builder Paul Waller didn’t see Page play last year when the musician visited the company’s Custom Shop and factory in Corona, CA. But he saw something altogether rarer. 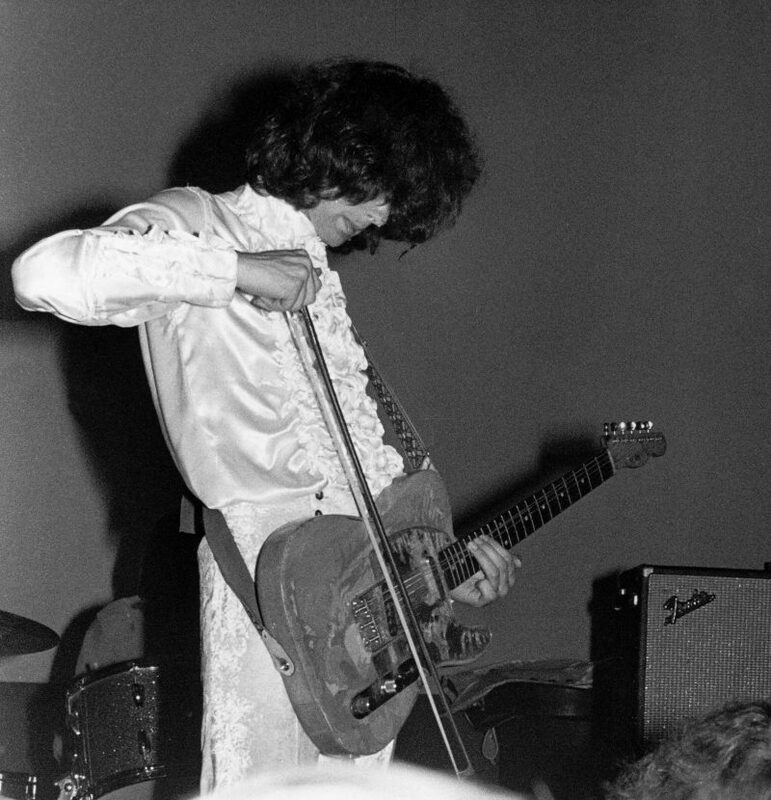 The occasion was Page checking out a special project with Fender to mark the 50th anniversary of the release of Led Zeppelin’s first album in 1969. For generations of fans, Page will be forever associated with the sunburst 1959 Gibson Les Paul that he bought from Joe Walsh. But the guitar that he wielded in pre-Zep days with the Yardbirds and on Led Zeppelin I was a Fender Telecaster. And not just any Tele. The 1959 model came to Page as a gift from Jeff Beck when the pair were in the Yardbirds (the band also launched the career of Eric Clapton). In the fashion of the psychedelic times, Page had modified the guitar twice. First, he first added circular mirrors. Then in mid-1967, he stripped the guitar’s finish himself and, art student that he was, hand painted a red, orange, green, and blue motif that evoked a dragon. He finished it off with a clear-plastic pickguard protecting shimmery foil. This “dragon” Telecaster was Page’s weapon of choice for the first appearances of Led Zeppelin, after the guitarist assembled the lineup of fellow session veteran John Paul Jones on bass, vocalist Robert Plant, and drummer John Bonham. The quartet was briefly called the “New Yardbirds” before switching to Led Zeppelin. Page once said that the Tele was a more demanding instrument than the Les Paul he’d later deploy to great effect in Zep’s live performances through the 1970s. But he also lauded its rewards, and anyone who’s ever turned up the volume on the proto-punk riff of “Communication Breakdown” knows what he’s talking about – it’s pure Telecaster attitude and bite. The dragon Tele, sadly, was done in, the story has it, by a Page friend who eliminated the dragon artwork. Page then saved the neck and used it for a brown B-bender Tele that he has pulled out periodically (the B-bender has a special apparatus that enables Page’s Tele to mimic pedal-steel tones). According to Waller, Fender wasn’t thinking about reviving the dragon design. Waller labors at Fender’s famous Custom Shop, where he builds coveted takes on Fender’s guitars for professional musicians and discerning collectors. But working with Page over the course of the year set a new standard. Page is an exacting steward of Led Zeppelin’s legacy, and the new dragon Telecaster introduced Waller to the guitarist’s scrupulous process. But the nearly eight-month undertaking, commencing last February, wasn’t a breeze by any estimation. With Page in London and Waller in southern California, samples of Telecaster bodies had been sent back and forth. 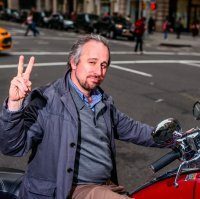 “I provided many in the beginning,” Waller said. What was tricky was matching the grain of the wood, which on the original instrument was distinctive. The dragon design was worked out using what Waller described as a “paint by numbers” template. “It took me hours to do the first couple of guitars,” he recalled. Reviving Page’s Tele wasn’t merely about the visuals. The Telecaster was Leo Fender’s first proper solidbody guitar, revolutionizing jazz, country, and blues and kicking off rock ‘n roll; it was preceded by a more basic design, the Esquire. It’s a simple thing, intentionally – a cutting board with a neck, tuners, pickups, and strings. The bridge pickup is an icepick, while the next pickup is mellow. In the middle position, the Tele can imitate an acoustic guitar. Waller knows his instruments from this period. “We’ve probably made more ’59 Teles than they did in 1959,” he joked. 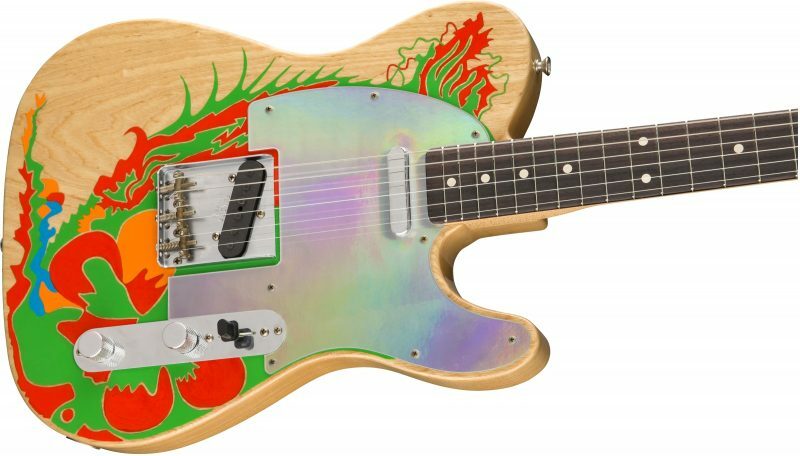 Two packages will be available for the 50 dragon Teles and the 50 mirror Teles, called “Limited Edition Jimmy Page Telecaster Set.” The mirrors guitar will have a Fender tweed case and include the Herco nylon picks that Page favors, as well as a coiled lead and a signed certificate of authenticity. The dragon will come with a special display case, a violin bow, and two straps: one white “seat belt” and one extra-long leather. It will also include Herco picks, a coiled lead, and a signed certificate of authenticity. The sets will go on sale in March and cost $25,000 apiece. 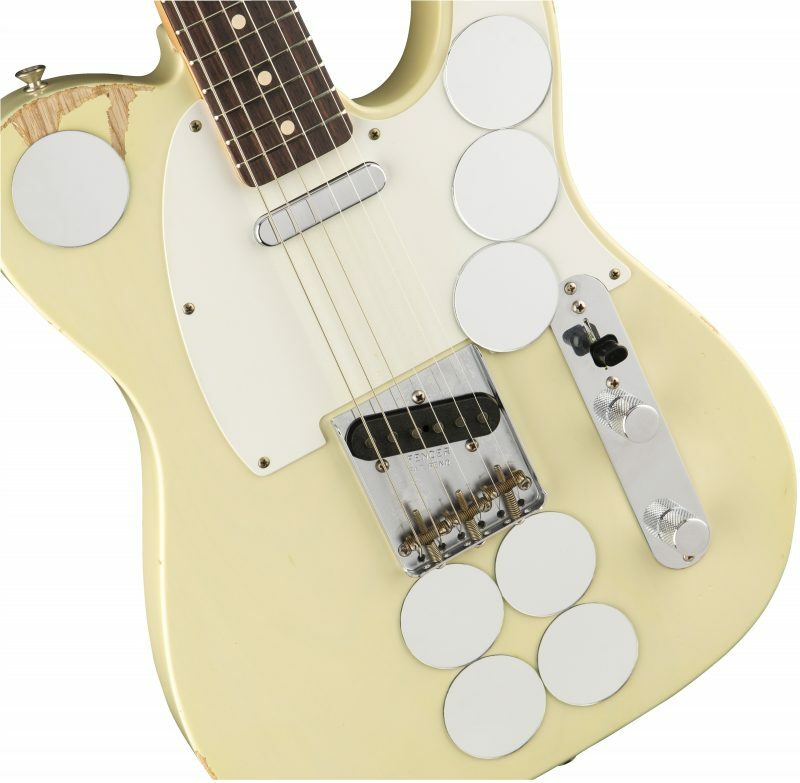 “Fender will also build both mirror and painted versions on its production lines, which will be more accessibly priced for a broader base of fans to purchase,” the company said. Those guitars will run $2,499 for the mirror Tele, available in spring, and $1,399 for the dragon Tele, following in summer. 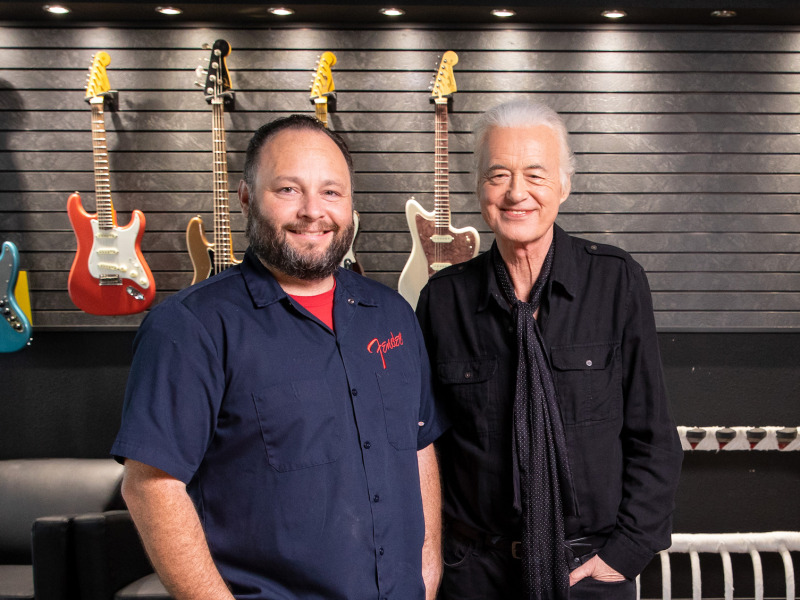 Last year, as Fender was preparing to compete the 100 “Limited Edition Jimmy Page Telecaster Sets,” Page journeyed to the Los Angeles area to sign headstocks, tour the Fender factory, and add some finishing touches to the Custom Shop dragon Teles. No Telecasters were played in Waller’s presence. But Page actually painting? His brief time in art school is the stuff of Led Zeppelin lore. Page himself is a noted collector of Pre-Raphaelite art and he lives in William Burges’ architecturally important Tower House in London, built in the late 19th century and a stunning example of the Victorian era’s gothic revival style. Page always thought of Zep as art – alchemical sonic aesthetics, in fact, four unique elements coming together to create a magical fifth – and for the better part of a decade, he’s dedicated himself to preserving the group’s legacy, through remastered box sets of Zep’s albums as well as a photographic autobiography. But his personal, pre-Zeppelin art has always been a mystery, and the dragon Telecaster is essentially the only example anyone has ever seen. “He was having a lot of fun,” Waller said.